Devolver always has my favorite showcase at E3, and it’s not just because I get to escape from the stale-air conditioned hell of the LA Convention Center to rake in some Southern California sunshine—though that is, scientifically, part of it. Never underestimate the effect Vitamin D has on your happiness. But it’s more than that. Over the past few years, Devolver has proved itself one of video gaming’s most exciting publishers. Does every game hit? No. 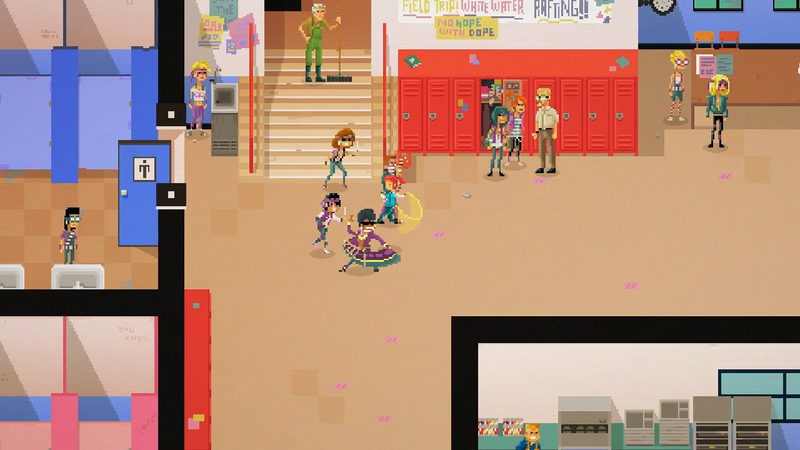 Some of Devolver’s titles prove better as concepts than full-length games. Others are, frankly, weird as hell. They’re all interesting though, and E3 2015 was no exception. In addition to hosting one of my most-anticipated games of the moment, Shadow Warrior 2, I also checked out a lineup that includes everything from a Viking-inspired dungeon crawler to…another pigeon game. For real. Well, I tried Eitr. It’s great. Despite the lo-fi pixel art aesthetic, Eitr has quite a bit in common with both Diablo and Dark Souls. 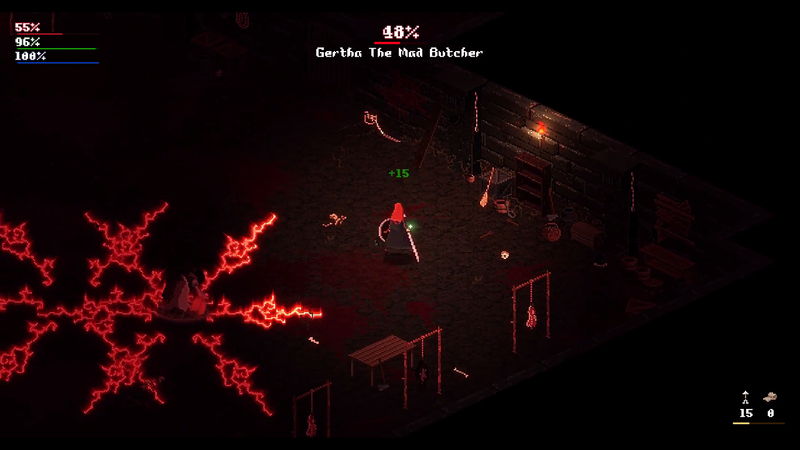 The former comparison is obvious: It’s an isometric action-RPG. You’re crossing through the nine worlds of Norse mythology instead of the planes of Hell, but it’s otherwise an obvious inspiration. The Dark Souls aspect comes into play with the game’s leveling system. Killing enemies, exploration, and the like earn you “Favor” with the gods. While Favor can be used like normal XP, by purchasing permanent upgrades, you can also hold onto it and receive additional stat benefits. Thus, you could have a Level 1 character with 99 Favor who is much more powerful than a Level 99 character. It’s an interesting twist. There’s no release date for Eitr yet, but I’m definitely curious to see how it shapes up. The combat is tight, in that “Make one mistake and you’re potentially doomed” way, and I’ve always been a fan of Norse mythology. This one’s going on my watch list. Somebody at Devolver really loves Hotline Miami. I say that because in addition to publishing both the original game and its sequel, Devolver seems to pump out plenty of games with a similarly grimy, drug-fueled aesthetic. Mother Russia Bleeds is king of that category. 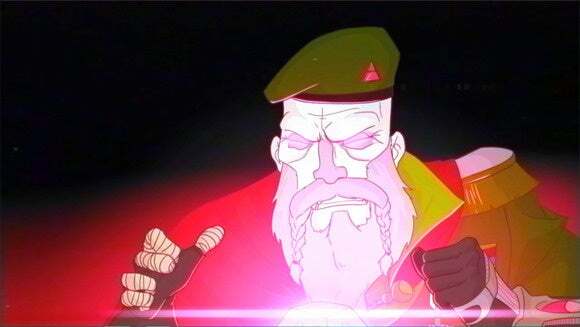 While it’s a sidescrolling beat-‘em-up instead of a top-down murder simulator, Mother Russia Bleeds screams Hotline Miami. It’s got the same propensity for over-the-top violence, a similar drug-fueled nightmare of a plot—hell, it even uses some of the same color palette. That’s not to say it’s a bad thing. 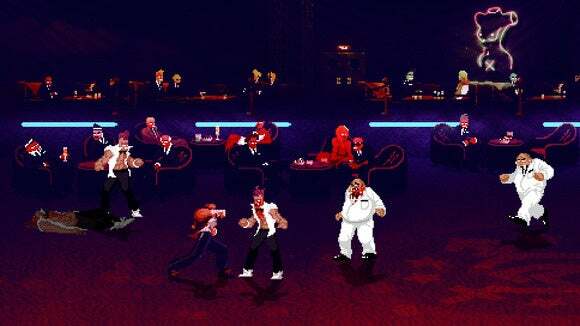 Mother Russia Bleeds looks like it’ll be crazy fun if you miss the Golden Axe/ Streets of Rage/Double Dragon days of yore. Except instead of eating a turkey out of the trash to regain health, now you’re injecting heroin. Or something. I don’t know, it’s dark and edgy. The best part of Crossing Souls is when you’re not playing it. That’s not to say the core top-down action-RPG (think Link to the Past mixed with Earthbound) game is bad. Not at all! It’s chock full of ‘80s pop culture references and seems like it’ll be hilarious. Plus you’re constantly switching between the realms of the living and dead, which means you’ll encounter…well, some weirdos. Here’s the game part of Crossing Souls. 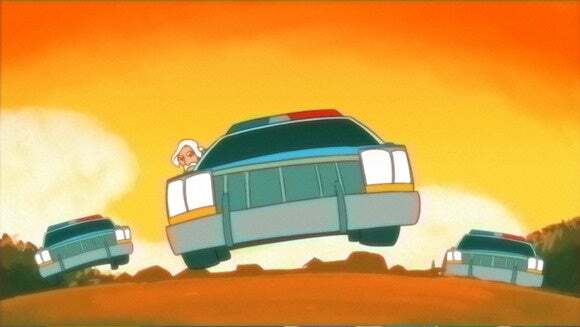 ...And here’s a bit from one of the ‘80s cartoon-styled cutscenes. See also: The image at the top of the article. That’s some Banner Saga level of animation. It’s not even like playing a game—it’s a mixed-media game/TV hybrid. It’s stunning enough that I’m interested in seeing more, even though I feel like I barely know anything about how Crossing Souls will play. Which brings us to Devolver’s final game of E3 2015, Hatoful Boyfriend: Holiday Star—the sequel/expansion to last year’s pigeon dating-sim Hatoful Boyfriend. Yes, pigeon dating simulator. As in the bird. Clearly you missed the memo. Hatoful Boyfriend: Holiday Star has actually existed for a while, but Devolver’s giving it the same remaster/translation treatment as last year’s iteration. And unlike the original Hatoful Boyfriend, Holiday Star is more visual novel and less dating sim. It is still 100 percent weird, though. Expect tons of bird-based puns, bad jokes, and over the top action. During my brief demo, five birds joined together Care Bear-style to form a psionic shield and deflect tank shells. And I swear that actually happened and wasn’t just something I made up. Remember when I said some of Devolver’s games are weird? 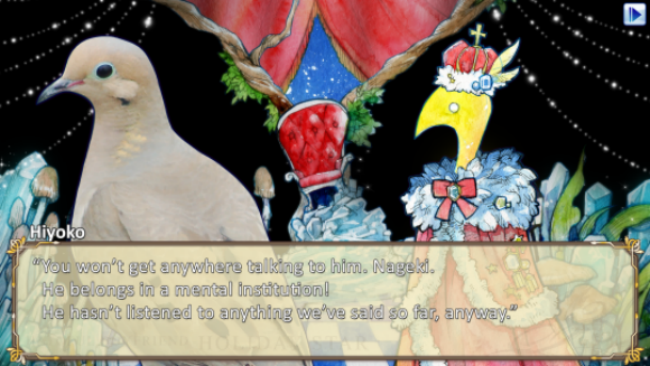 Well in that case Hatoful Boyfriend: Holiday Star is the most Devolver of them all.